Found on this website is a wide selection of carports and carport styles including portable carports or car ports, metal carports or RV covers, carport kits, steel carports and vehicle carcovers. T There are literally tens of thousands of carport configurations possible. That is where we come in, to offer the expertise to assist you in designing the carport to fit your circumstances. Not just with your circumstances do we offer direction, but we also take into consideration the requirements in your area for snow load ratings, seismic ratings and wind load ratings. So, it is not just you need a carport this wide, or this long, or this tall; but we tailor your carport for your counties requirements. We have the expertise, engineers and design staff to get the job done right the very first time. That is why we are trusted by these clients. Many on our sales staff have installed carports in the past and have the knowhow to offer sound advice. C What most people are surprised about when seeing our carports in person is how solidly they are built. They can't believe that you can walk on the roof of a carport. Another nice feature about our carports is that they can be moved to another location at another date. Just call us and we will arrange to have a crew go out to disassemble, load your carport on a truck, move it to the new location and assemble it at your new site. Our #1 question asked, "Does the price for the carport on the following pages include shipping, anchoring and installation within the normal service area?" Yes, yes and yes. The specific prices on the following pages for car ports include anchoring, shipping and installation on your level site within our normal service area in the states of AL, Alabama, AR, Arkansas, AZ, Arizona, CA, California, CT, Connecticut, DE, Delaware, DC, District of Columbia, FL, Florida, GA, Georgia, IL, Illinois, IN, Indiana, IA, Iowa, KS, Kansas, KY, Kentucky, LA, Louisiana, MD, Maryland, MI, Michigan, MS, Mississippi, MO, Missouri, NE, Nebraska, NV, Nevada, NY, New York, NJ, New Jersey, NC, North Carolina, OH, Ohio, OK, Oklahoma, PA, Pennsylvania, SC, South Carolina, TN, Tennessee, TX, Texas, VA, Virginia, WV, West Virginia. The second most frequently asked question about the installation of your metal carport, "How long before my carport is installed?" Usually installed in 2-6 weeks. Are the prices for car ports current on the following pages? What if I want a carport with 14 gauge framing, 2 gable ends and no side panels? What if I want a carport with 12 gauge framing, both sides closed to the ground and one end closed? What if I want a carport with 14 gauge framing and no additional options? What if I want a carport with 12 gauge framing, 1 gable end and 2 side panels on each side? Yes. 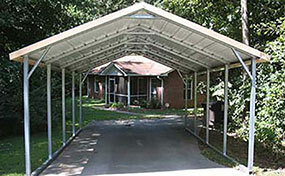 For example you may need a carport that is 21&apos; wide x 23&apos; long. We will make it that size. To determine the cost it would be the exact same cost as the next larger standard size carport. So, for this example it would be the same cost as a 22&apos; wide x 26&apos; long carport. This formula would apply in every circumstance. Does a color choice add to the cost of my carport or RV port? Can I buy the carport materials or carport kit and assemble it myself? Yes in some instances the car port materials are available. If it is, just deduct 5% from the prices quoted on the following pages. All materials will be delivered to your home. You cannot pick up materials under any circumstances. No assembly instructions are provided. This is your choice if you decide to purchase and assemble yourself (not our recommendation). Do I have to pay sales tax for my RV shed or car canopy? 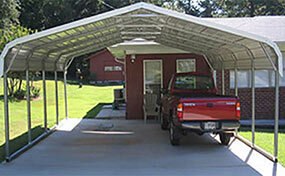 If the carport is to be installed over an existing structure in place there is an additional charge of $200. Trip charges will apply outside of normal service area and may apply toward outer edges of service area. Installation on an un-level area from 4"-9", additional labor charge of $150. Additional labor charge to construct the unit and slide it over, typically $200 and is not possible in every circumstance. Keep in mind that the aforementioned additional fees are unusual and very likely will be unnecessary in your normal circumstances. Is there a discount if I purchase more than one auto cover or RV carport? What colors can I choose from for my carport? We have 15 different colors to choose from for your car port. You may choose one color for the roof, a different color for the trim, a different color for the sides, and if a gable end is desired, a different color for it - at no additional charge. What is the warranty for our metal car ports? You could do what was done here for custom leveling. We&apos;ll make carports as long as you need. What if I want to enclose the whole carport and make an RV garage or auto garage? Information on an enclosed structure. How tall does this need to be to cover my motor home or camper? The number one mistake people make is they get them too tall for RV&apos;s. If you were in the pouring rain with an umbrella in your hand, would you hold the umbrella as high as you could or hold it down close to your head for added protection from the elements?… Even the tallest RV's on the market today are 12&apos;6" tall to the top of the A/C. No, we will not attach our steel structures or awnings. Call our knowledgeable staff toll free at 1-877-942-3745 Monday through Friday. A very interesting viewpoint regarding the common law of business. Most people prefer a carport width of at least 20&apos; wide for 2 cars, although some report that 18&apos; wide is sufficient. See how our carports are assembled. Most box eve style carports, the roof pitch is approximately 4:12. Most regular style carports, the roof pitch is approximately 3:12. For 12&apos; to 24&apos; wide carports the post are spaced no more than every 5&apos; apart. For 26&apos; to 30&apos; wide carports the post are spaced no more than every 3&apos;6". Side panels will come down 3&apos; (three feet). So if you order one side panel, you will have three feet of coverage. If you order two side panels, you will have six feet of coverage. Three panels would equal nine feet of coverage. 32" long anchors are inserted through pre-drilled holes in the base rail. The anchors are driven into the ground with a sledge hammer for a secure hold. See our secure order form, fill it and click submit. How do I choose carport or rv cover style? Notice the choices in styles at the top of the carport or rv cover style page.